This article is about Lawrence (disambiguation). For other uses, see Lawrence, Massachusetts (disambiguation). Location in Essex County and the state of Massachusetts. 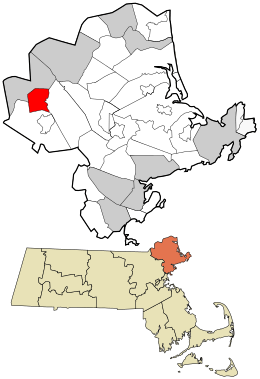 Lawrence is a city in Essex County, Massachusetts, United States, on the Merrimack River. As of the 2010 census, the city had a population of 76,377, which had risen to an estimated 78,197 as of 2014. Surrounding communities include Methuen to the north, Andover to the southwest, and North Andover to the southeast. Lawrence and Salem are the county seats of Essex County. Lawrence is part of the Merrimack Valley. Manufacturing products of the city include electronic equipment, textiles, footwear, paper products, computers, and foodstuffs. Lawrence was the residence of poet Robert Frost for his early school years; his essays and poems were first published in the Lawrence High School newspaper. 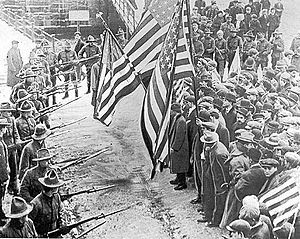 1912 Lawrence textile strike, Massachusetts National Guardsmen with fixed bayonets surround a parade of strikers. Native Americans, namely the Pennacook or Pentucket tribe, had a presence in this area. Evidence of farming at Den Rock Park and arrowhead manufacturing on the site of where the Wood Mill now sits have been discovered. Europeans first settled the Haverhill area in 1640, colonists from Newbury following the Merrimack River in from the coast. The area that would become Lawrence was then part of Methuen and Andover. The first settlement came in 1655 with the establishment of a blockhouse in Shawsheen Fields, now South Lawrence. The future site of the city (formerly parts of Andover and Methuen), was purchased by a consortium of local industrialists. The Water Power Association members: Abbott Lawrence, Edmund Bartlett, Thomas Hopkinson of Lowell, John Nesmith and Daniel Saunders, had purchased control of Peter's Falls on the Merrimack River and hence controlled Bodwell's Falls the site of the present Great Stone Dam. The group allotted fifty thousand dollars to buy land along the river to develop. In 1844, the group petitioned the legislature to act as a corporation, known as the Essex Company, which incorporated on April 16, 1845. The first excavations for the Great Stone Dam to harness the Merrimack River's water power were done on August 1, 1845. The Essex Company would sell the water power to corporations such as the Arlington Mills, as well as organize construction of mills and build to suit. Until 1847, when the state legislature recognized the community as a town, it was called interchangeably the "New City", "Essex" or "Merrimac". The post office, built in 1846, used the designation "Merrimac". 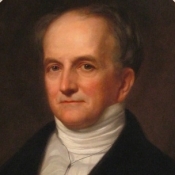 Incorporation as a city would come in 1853, and the name "Lawrence", merely chosen as a token of respect to Abbott Lawrence, who it cannot be verified ever saw the city named after him. Canals were dug on both the north and the south banks to provide power to the factories that would soon be built on its banks as both mill owners and workers from across the city and the world flocked to the city in droves; many were Irish laborers who had experience with similar building work. The work was dangerous: injuries and even death were not uncommon. Working conditions in the mills were unsafe and in 1860 the Pemberton Mill collapsed, killing 145 workers. As immigrants flooded into the United States in the mid to late 19th century, the population of Lawrence abounded with skilled and unskilled workers from several countries. Lawrence was the scene of the infamous Bread and Roses Strike, also known as the Lawrence Textile Strike, one of the more important labor actions in American history. Lawrence was a great wool-processing center until that industry declined in the 1950s. The decline left Lawrence a struggling city. The population of Lawrence declined from over 80,000 residents in 1950 (and a high of 94,270 in 1920) to approximately 64,000 residents in 1980, the low point of Lawrence's population. Like other northeastern cities suffering from the effects of post-World War II industrial decline, Lawrence has often made efforts at revitalization, some of them controversial. For example, half of the enormous Wood Mill, powered by the Great Stone Dam and once the largest mills in the world, was knocked down in the 1950s. The Lawrence Redevelopment Authority and city officials utilized eminent domain for a perceived public benefit, via a top down approach, to revitalize the city throughout the 1960s. Known first as urban redevelopment, and then urban renewal, Lawrence's local government's actions towards vulnerable immigrant and poor communities, contained an undercurrent of gentrification which lies beneath the goals to revitalize Lawrence. There was a clash of differing ideals and perceptions of blight, growth, and what constituted a desirable community. Ultimately the discussion left out those members of the community who would be directly impacted by urban redevelopment. Under the guise of urban renewal, large tracts of downtown Lawrence were razed in the 1970s, and replaced with parking lots and a three-story parking garage connected to a new Intown Mall intended to compete with newly constructed suburban malls. The historic Theater Row along Broadway was also razed, destroying ornate movie palaces of the 1920s and 1930s that entertained mill workers through the Great Depression and the Second World War. The city's main post office, an ornate federalist style building at the corner of Broadway and Essex Street, was razed. Most of the structures were replaced with one-story, steel-frame structures with large parking lots, housing such establishments as fast food restaurants and chain drug stores, fundamentally changing the character of the center of Lawrence. Lawrence also attempted to increase its employment base by attracting industries unwanted in other communities, such as waste treatment facilities and incinerators. Recently the focus of Lawrence's urban renewal has shifted to preservation rather than sprawl. Immigrants from the Dominican Republic and migrants from Puerto Rico began arriving in Lawrence in significant numbers in the late 1960s, attracted by cheap housing and a history of tolerance toward immigrants. In 1984, tensions between remaining working class whites and increasing numbers of Hispanic youth flared into a riot, centered at the intersection of Haverhill Street and Oxford Street, where a number of buildings were destroyed by Molotov cocktails and over 300 people were arrested. Lawrence saw further setbacks during the recession of the early 1990s as a wave of arson plagued the city. Over 200 buildings were set alight in an eighteen-month period in 1991–92, many of them abandoned residences and industrial sites. The Malden Mills factory burned down on December 11, 1995. CEO Aaron Feuerstein decided to continue paying the salaries of all the now-unemployed workers while the factory was being rebuilt. By going against common CEO business practices, especially at a time when most companies were downsizing and moving overseas, he achieved recognition for doing the right thing. 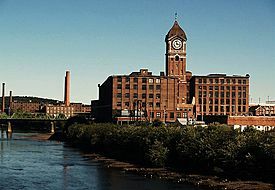 A sharp reduction in violent crime starting in 2004 and massive private investment in former mill buildings along the Merrimack River, including the remaining section of the historic Wood Mill – to be converted into commercial, residential and education uses – have lent encouragement to boosters of the city. In June 2007, the city approved the sale of the Intown Mall, largely abandoned since the early 1990s recession, to Northern Essex Community College for the development of a medical sciences center, the construction of which commenced in 2012 when the InTown Mall was finally removed. A large multi-structure fire in January 2008 destroyed many wooden structures just south of downtown. A poor financial situation that has worsened with the recent global recession and has led to multiple municipal layoffs had Lawrence contemplating receivership. Lawrence has been aptly nicknamed the "Immigrant City". Starting with the Irish in the 1840s, it has been home to numerous different immigrant communities, most of whom arrived during the great wave of European immigration to America that ended in the 1920s. Since the early 1970s, Lawrence has become home to a sizable Hispanic population, primarily Dominicans and Puerto Ricans. In 2010, 74% of the population of Lawrence was Hispanic. Lawrence became home to large groups of immigrants from Europe, beginning with the Irish in 1845, Germans after the social upheaval in Germany in 1848, and French Canadians seeking to escape hard northern farm life from the 1850s onward. A second wave began arriving after 1900, as part of the great mass of Italian and Eastern European immigrants, including Jews from Russia, Poland, Lithuania and neighboring regions. Immigration to the United States was severely curtailed in the 1920s with the Immigration Act of 1924, when foreign born immigration to Lawrence virtually ceased for over 40 years. In 1890, the foreign-born population of 28,577 was divided as follows, with the significant remainder of the population being children of foreign born residents: 7,058 Irish; 6,999 French Canadians; 5,131 English; 2,465 German; 1,683 English Canadian. In 1920, toward the end of the first wave of immigration, most ethnic groups had numerous social clubs in the city. The Portuguese had 2; the English had 2; the Jews had 3; the Armenians, 5; the Lebanese and Syrians, 6; the Irish, 8; the Polish, 9; the French Canadians and Belgian-French, 14; the Lithuanians, 18; the Italians, 32; and the Germans, 47. However, the center of social life, even more than clubs or fraternal organizations, was churches. Lawrence is dotted with churches, many now closed, torn down or converted into other uses. These churches signify, more than any other artifacts, the immigrant communities that once lived within walking distance of each church. Irish immigrants arrived in Lawrence at its birth, which coincided with the Great Potato Famine of the 1840s, the event that drove great numbers of Irish out of Ireland. The Great Stone Dam, constructed in from 1845–1848 to power the nascent textile mills, was largely built by Irish laborers. The first Irish immigrants settled in the area south of the Merrimack River near the intersection of Kingston Street and South Broadway. Their shantytown settlement put them close to the dam being constructed, but away from the Essex Corporation row houses built north of the river to attract New England farm girls as millworkers. The religious needs of the Irish were initially met by the Immaculate Conception church, originally erected near the corner of Chestnut and White Street in 1846, the first Roman Catholic church in Lawrence. In December, 1848, the Reverend James O'Donnell erected "old" St. Mary's Church. By 1847, observers counted over ninety shanties in the Irish shantytown. In 1869, the Irish were able to collect sufficient funds to form their own church, St. Patrick's, on South Broadway. The first sizable German community arrived following the revolutions of 1848. However, a larger German community was formed after 1871, when industrial workers from Saxony were displaced by economic competition from new industrial areas like the Ruhr. The German community was characterized by numerous school clubs, shooting clubs, national and regional clubs, as well as men's choirs and mutual aid societies, many of which were clustered around the Turn Verein, a major social club on Park Street. Some Italian immigrants celebrated Mass in the basement chapel of the largely Irish St. Laurence O'Toole Church, at the intersection of East Haverhill Street and Newbury Street, until they had collected sufficient funds to erect the Holy Rosary Church in 1909 nearby at the intersection of Union Street and Essex Street. Immigrants from Lentini (a comune in the Sicilian province of Syracuse) and from the Sicilian province of Catania maintained a particular devotion to three Catholic martyrs, Saint Alfio, Saint Filadelfo and Saint Cirino, and in 1923 began celebrating a procession on their feast day. Although most of the participants live in neighboring towns, the Feast of Three Saints festival continues in Lawrence today. Many of the Italians who lived in the Newbury Street area had immigrated from Trecastagni, Viagrande, Acireale, and Nicolosi, Italy. French Canadians were the second major immigrant group to settle in Lawrence. In 1872, they erected their first church, St. Anne's, at the corner of Haverhill and Franklin streets. Within decades, St. Anne's established a "missionary church", Sacred Heart on South Broadway, to serve the burgeoning Québécois community in South Lawrence. Later it would also establish the "missionary" parishes in Methuen: Our Lady of Mount Carmel and St. Theresa's (Notre-Dame du Mont Carmel et St-Thérèse). The French-Canadians arrived from various farming areas of Quebec where the old parishes were overpopulated: some people moved up north (Abitibi and Saguenay–Lac-Saint-Jean), while others moved to industrial towns to find work (Montreal, Quebec; but also in the United States). Others who integrated themselves into these French-Canadian communities were actually Acadians who had left the Canadian Maritimes of New Brunswick and Nova Scotia also in search of work. Lawrence residents frequently referred to their Arabic-speaking Middle Eastern community as "Syrian". In fact, most so-called Syrians in Lawrence were from present-day Lebanon and were largely Maronite Christian. Lebanese immigrants organized St. Anthony's Maronite Church in 1903, as well as St. George's Orthodox Church, the oldest Greek Orthodox-rite church in the United States. Jewish merchants became increasingly numerous in Lawrence and specialized in dry goods and retail shops. The fanciest men's clothing store in Lawrence, Kap's, established in 1902 and closed in the early 1990s, was founded by Elias Kapelson, born in Lithuania. Jacob Sandler and two brothers also immigrated from Lithuania in approximately 1900 and established Sandlers Department Store, which continued in business until 1978. In the 1880s, the first Jewish arrivals established a community around Common, Valley, Concord and Lowell streets. In the 1920s, the Jews of Lawrence began congregating further up Tower Hill, where they erected two synagogues on Lowell Street above Milton Street, as well as a Jewish Community Center on nearby Haverhill Street. All three institutions had closed their doors by 1990 as the remaining elderly members of the community died out or moved away. The Polish community of Lawrence was estimated to be only 600–800 persons in 1900. However, by 1905, the community had expanded sufficiently to fund the construction of the Holy Trinity Church at the corner of Avon and Trinity streets. Their numbers grew to 2,100 Poles in 1910. Like many of their immigrant brethren from other nations, most of the Poles were employed in woolen and worsted goods manufacturing. A sizable English community, composed mainly of unskilled laborers who arrived after 1880, sought work in the textile mills where they were given choice jobs by the Yankee overseers on account of their shared linguistic heritage and close cultural links. Not all immigrants to Lawrence were foreign-born or their children. Yankee farmers, unable to compete against the cheaper farmlands of the Midwest that had been linked to the East coast by rail, settled in corners of Lawrence. Congregationalists were the second Protestant denomination to begin worship in Lawrence after the Episcopalians, with the formation of the Lawrence Street Congregational Church in 1847, and the first in South Lawrence, with the erection in 1852 of the first South Congregational Church on South Broadway, near the corner of Andover Street. Immigration of foreign born workers to Lawrence largely ceased in 1921 with the passage of strict quotas against immigrants from the countries that had supplied the cheap, unskilled workers. Although many quotas were lifted after the Second World War, foreign immigration to Lawrence only picked up again in the early 1960s with Hispanic immigrants from Cuba, Puerto Rico, the Dominican Republic and other Latin American countries. Immigrants from Southeast Asia, particularly Vietnam, have also settled in Lawrence. Indicative of immigration trends, several Catholic churches now conduct masses in two or more languages. St. Patrick's Church, a Catholic church in Lawrence and once an Irish bastion, has celebrated Spanish masses on Sundays since 1999. A mass in Vietnamese is also offered every other week. St. Mary's of the Assumption Parish is the largest Catholic parish in Lawrence by Mass attendance and number of registered parishioners. It has the largest multi-lingual congregation in the city and has been offering Spanish masses since the early 1990s. Since the 1990s, increasing numbers of former Catholic churches, closed since the 1980s when their Irish or Italian congregations died out, have been bought by Hispanic evangelical churches. Dominican Republic, 22%; Puerto Rican, 22%; other Hispanic or Latino, 12%; Irish, 7%; Italian, 7%, French (except Basque), 5%; Black or African American, 5%; French Canadian, 5%; English, 3%; Arab, 2%; German, 2%; Lebanese, 2%; Central American, 1%; Polish, 1%; Portuguese, 1%; Guatemalan, 1%; Vietnamese, 1%; South American, 1%; Spanish, 1%; Cambodian, 1%; Scottish, 1%; Cuban, 1%; Scotch-Irish, 1%; Ecuadoran, 1%. High Service Water Tower (1895), also called Tower Hill Water Tower, a notable eyecatcher or folly, named an American Water Landmark in 1979 by the American Water Works Association. According to the United States Census Bureau, the city has a total area of 7.4 square miles (19 km2), of which 7.0 square miles (18 km2) is land and 0.4 square miles (1.0 km2) (6.07%) is water. Lawrence is on both sides of the Merrimack River, approximately 26 miles (42 km) upstream from the Atlantic Ocean. On the north side of the river, it is surrounded by Methuen. On the south side of the river, the town is bordered by North Andover to the east, and Andover to the south and southwest. Lawrence is approximately 30 miles (48 km) north-northwest of Boston and 27 miles (43 km) southeast of Manchester, New Hampshire. Aside from the Merrimack River, other water features include the Spicket River, which flows into the Merrimack from Methuen, and the Shawsheen River, which forms the southeastern border of the city. Lawrence has two power canals that were formerly used to provide hydropower to the mills - one on the north bank of the river, the other on the south. Channeling water into these canals is the Great Stone Dam, which lies across the entire Merrimack and was, at the time of its construction in the 1840s, the largest dam in the world. The highest point in Lawrence is the top of Tower Hill in the northwest corner of the city, rising approximately 240 feet (73 m) above sea level. Other prominent hills include Prospect Hill, in the northeast corner of the city, and Mount Vernon, along the southern edge of the city. Most industrial activity was concentrated in the flatlands along the rivers. Den Rock Park, a wooded conservation district on the southern edge of Lawrence that spans the Lawrence-Andover town line, provides recreation for nature lovers and rock-climbers alike. There are also several small parks throughout town. Lawrence lies along Interstate 495, which passes through the eastern portion of the city. There are three exits entirely within the city, though two more provide access from just outside the city limits. The town is also served by Route 28 passing from south to north through the city, and Route 110, which passes from east to west through the northern half of the city. Route 114 also has its western terminus at Route 28 at the Merrimack River. 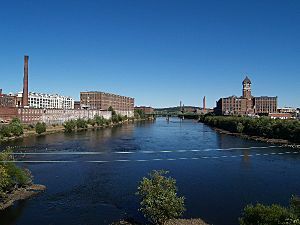 Lawrence is the site of four road crossings and a railroad crossing over the Merrimack, including the O'Leary Bridge (Route 28), a railroad bridge, the Casey Bridge (bringing Parker Street and access to Route 114 and the Lawrence MBTA station to the north shore), the Duck Bridge (which brings Union Street across the river), and the double-decked O'Reilly Bridge, bringing I-495 across the river. Lawrence is the western hub of the Merrimack Valley Regional Transit Authority's bus service. It is also home to the Senator Patricia McGovern Transportation Center, home to regional bus service and the Lawrence stop along the Haverhill/Reading Line of the MBTA Commuter Rail system, providing service from Haverhill to Boston's North Station. Lawrence Municipal Airport provides small plane service, though it is actually in neighboring North Andover. Lawrence is approximately equidistant from Manchester-Boston Regional Airport and Logan International Airport. Future plans to revitalize the Manchester and Lawrence branch to the north, leading to Manchester, New Hampshire, will allow the MBTA to operate rail service up to Manchester from Lawrence, in conjunction with Pan Am Freights. Lawrence has a humid continental climate (Köppen climate classification Dfa), which is typical for the southern Merrimack valley region in eastern Massachusetts. According to the U.S. Census Bureau 2010 Census, the city's population is 76,377, the population density is 10,973.7 per square mile (4237/km²), and there are 27,137 households (25,181 occupied). The racial makeup of the city is 42.8% White (20.5% non-Hispanic), 7.6% Black or African American, 2.5% Asian (0.8% Vietnamese, 0.8% Cambodian), 1.3% American Indian or Alaskan Native, 0.1% (57 total) Hawaiian Native or Pacific Islander, 39.3% some other race, 6.5% two or more races, and 73.8% of the population is Hispanic or Latino (of any race) (39.6% Dominican, 22.2% Puerto Rican, 3.0% Guatemalan, 0.8% Ecuadorian, 0.7% Mexican, 0.6% Salvadoran, 0.5% Cuban) (U.S. Average: 12.5%). As of the census of 2000, there were 72,043 people, 24,463 households, and 16,903 families residing in the city. The population density was 10,351.4 people per square mile (3,996.5/km²). There were 25,601 housing units at an average density of 3,678.4 per square mile (1,420.2/km²). The racial makeup of the city was 48.64% White (U.S. Average: 72.4%), 4.88% African American (U.S. Average: 12.3%), 2.65% Asian (U.S. Average: 3.6%), 0.81% Native American (U.S. Average: 0.1%), 0.10% Pacific Islander (U.S. Average: 0.1%), 36.67% from other races (U.S. Average: 5.5%), 6.25% from two or more races (U.S. Average: 2.4%). There were 24,463 households where the average household size was 2.90 and the average family size was 3.46. 9.8% were 65 years of age or older. For every 100 females there were 91.6 males. For every 100 females age 18 and over, there were 86.8 males. The median income for a household in the city was $25,983 (U.S. Average: $41,994), and the median income for a family was $29,809 (U.S. Average: $50,046). Males had a median income of $27,772 versus $23,137 for females. The per capita income for the city was $11,360. About 21.2% of families (U.S. Average: 9.2%) and 34.3% (U.S. Average: 12.4%) of the population were below the poverty line, including 31.7% of those under age 18 and 20.1% of those age 65 or over. The Mayor of Lawrence, Daniel Rivera, said the city was "approximately 75% Spanish" following an incident where non English speaking callers were allegedly hung up on by a 911 operator. 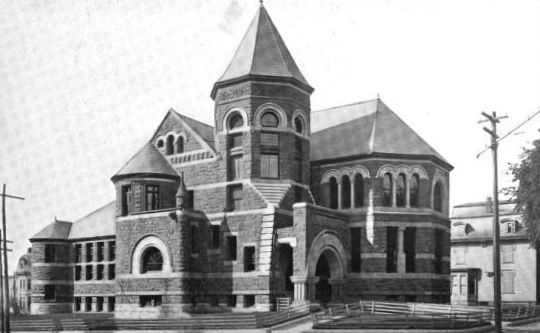 The Lawrence public library was established in 1872. In fiscal year 2008, the city of Lawrence spent 0.55% ($1,155,597) of its budget on its public library—some $16 per person. Lawrence's main newspaper is The Eagle-Tribune, one of the major newspapers for the Merrimack Valley that was founded in Lawrence in 1890 but later moved its facilities to the town of North Andover on Route 114. Lawrence is home to Rumbo (a bilingual English/Spanish paper) and Siglo 21 (a Spanish paper). Another newspaper closely covering Lawrence news is The Valley Patriot, a monthly paper published in North Andover. The city has one FM station, WEEI-FM 93.7, and four AM stations, WNNW 800, WCAP 980, WCCM 1110 and WLLH 1400. WMFP is the only television station operating out of the city, and the city is considered part of the Boston television market. What's Good in the Hood (est.2010), a local blog produced by youth, covers stories about Lawrence. Lawrence is served by Area codes 978 and 351. Originally a part of area code 617, it became part of area code 508 in 1988 before that, too, was split, with 978 covering the northern half of the old area code. Area code 351 is considered an overlay code. Lawrence, Massachusetts Facts for Kids. Kiddle Encyclopedia.